Yeah, I did SLACK off a bit this semester. A few Teen Science Café adult mentors have asked if we know of a way to better communicate with Teen Leaders, other than using group text or emails. In a group text, your phone is blowing up all day and the conversations can sometimes get off topic. With emails, some times teens “reply all” when its not necessary, or don’t when it is. And none of us have time to communicate individually. While looking for a better way to communicate, the TSCN came across an app/website called SLACK. The Teen Leaders at the Café Scientifique – Los Alamos program have beta tested and found SLACK to be the answer to our communication question. 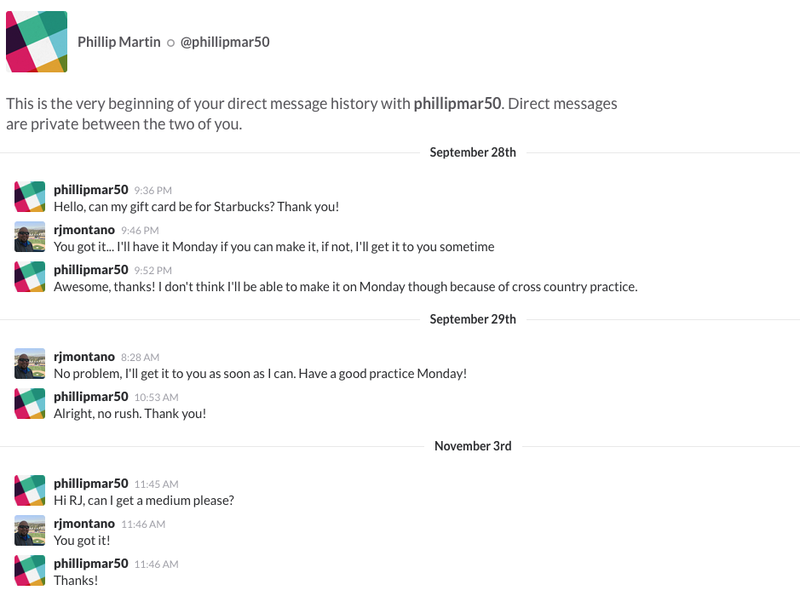 With SLACK, you are able to communicate with your teens as a whole, break it up into segments, or message them individually. In the general discussion board, you are able to send messages to the entire group. The example image shows what it looks like. In the conversation, the teens used SLACK to self organize and meet at the school library to make sure everything was taken care of for that nights café. You can also break the conversations into segments based on your committees in the “channels” section. We have our segments broken into Advertising, Food, General, Random, and Welcoming conversations. We are able to talk about these topics, and it’s automatically saved so you can go back and review the conversations. You can also send individual messages to your teens. In the example picture is a conversation with a teen about winning a prize for his part in getting the most teens to a café. 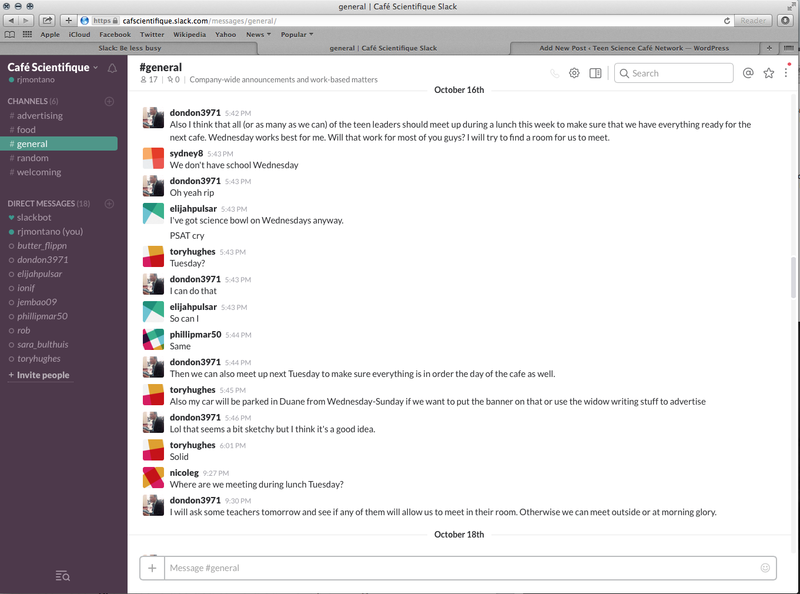 SLACK has proven to be an invaluable asset to the Los Alamos Café. The Teen Leaders usually meet for a planning meeting at a local pizza parlor two weeks before our cafés. At our last meeting, the teens decided to hold our next planning meeting, in the spring of 2017, on SLACK. Update to follow.